Another one for the daily photo challenge at photochallenge.org. Man, I am not keeping up but when I get the chance I try to shoot something. I had been thinking of this idea during the day. I am such a redneck. 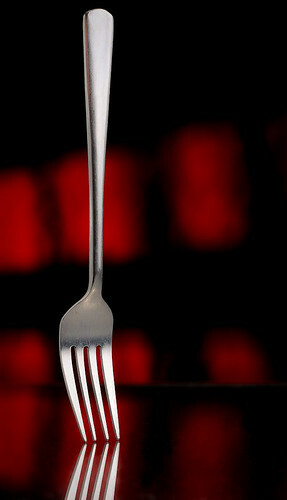 I thought, “How am I going to stand that fork up? . . . 12lb test!”. Tied it up. Took the line up over the umbrella and used a clamp to clamp the line to one of the struts of the umbrella. Got rid of it in PS. I shot the background strobe through my son’s chair as a cookie to give a little pattern. It was at 1/2 power. The key light is a shoot-thru umbrella with the strobe at 1/4 power. Very tight to the subject. Used the silver autoshade to add another specular highlight on the left side of the fork. I held it slightly behind the subject so there is a little separation between the speculars. ~ by pbphoto on May 27, 2009. Hey don’t you have like 6 kids now. Shouldn’t you be feeding someone? :) Oh. . .I see that the timetag is 2:03am. Sorry. Disregard the last few sentences. Thanks Lacey. Congratulations. I so hope that this is Lacey K. If not, my reply is way off base. Lacey, is that you?